Front cover of Volume 1 in English, published by Faber and Faber Ltd. The Philokalia is a collection of writings, mostly centering on practicing the virtues and spiritual living in a monastery. In recent decades it has become an important resource for Orthodox Christians, laity and clergy alike, in personal living and in some ways has achieved status as a major secondary spiritual written resource (after the primary one, Holy Scripture) along with St. John Climacus' The Ladder of Divine Ascent. The Philokalia—Greek for "love of the beautiful/holy/exalted"—was first assembled at Mount Athos by Ss. Nicodemus of the Holy Mountain and Makarios of Corinth. The first edition was published at Venice in 1782; a second was done at Athens in 1893, which included a prayer by Patriarch Kallistos; and a third at Athens between 1957 and 1963 by the Astir Publishing Company. All the original writings in the Philokalia were written in Greek with the exception of two, which were originally in Latin but then translated in Greek during the time of the Roman ("Byzantine") Empire. 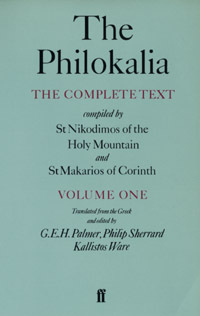 Soon the Philokalia was translated into multiple languages. In 1793, a Slavonic translation done by St. Paisii Velichkovskii (1722-1794), was published at Moscow under the title Dobrotolubiye, and later reprinted in 1822. This would be the version carried by the unnamed central character in The Way of a Pilgrim and was responsible for a spiritual revival in 19th century Russia, impacting a lot of her people, including Fyodor Dostoevsky. A second translation was published in 1857 and was done by St. Ignatii Brianchaninov (1807-1867). A third one was done by St. Theophan the Recluse (1815-1894), but he included other texts not in the Greek original as well as paraphrases or omissions of other sections. This translation was published in five volumes under the auspicies of the Russian Monastery of St. Panteleimon at Mount Athos in 1877. A Romanian translation first appeared in 1946 with Fr. Dumitru Staniloae presiding as editor (the fifth volume appeared in 1976 and it's expected to be eight volumes). A French translation is currently in the works. Both of these use the Greek. This listing of texts is based on the English translation, started by Bishop Kallistos Ware, G.E.H. Palmer and Philip Sherrard and published by Faber and Faber Ltd. The fifth volume has yet to be published. While there is no definite date set, it is predicted by the publisher to be made available sometime late in 2006. This translation uses the third edition published by the Astir Publishing Company. There is also an appendix entitled "On the Character of Men and on the Virtuous Life: 170 Texts." Nicodemus attributes it to the model monastic Antony of Egypt; however the language and the general idea is not explicitly Christian. It was included perhaps because it had resonances of Christianity and Nicodemus thought that another work—from Peter of Damascus—quotes from this work and attributes it to Antony. However no such connection can be found. Like all spiritual readings, the Philokalia should be read under the guidance of a spiritual father as to avoid misinterpretations or malpractice of spiritual remedies. For those who are not practicing monastics, the idea of divorcing oneself from the normal life may seem extreme. Nevertheless, keep in mind that those who practice the monastic life are called to live a total Christ-centered life or to use Christ's words "becoming eunuchs for the kingdom of heaven's sake" (Matthew 19:12). In spite of the audience, there are also sayings and writings that are relevant to those who are called to "remain in the world" such as the practice of virtues or the controlling, even extinguishing, of the passions. Also, this work is not meant to be read all at once. It should be approached like a Merck's Medical Journal: look up the things that are relevant for whatever moment you as a reader need it. The English translations make it easier to use it in this way. For an example, if you are wondering about what patience is about, simply look at the index. If the page numbers are in bold, then it is a significant passage of text addressing that issue; otherwise it may appear as either one sentence or a small part of a larger context. This page was last edited on September 18, 2015, at 19:14. This page has been accessed 131,123 times.